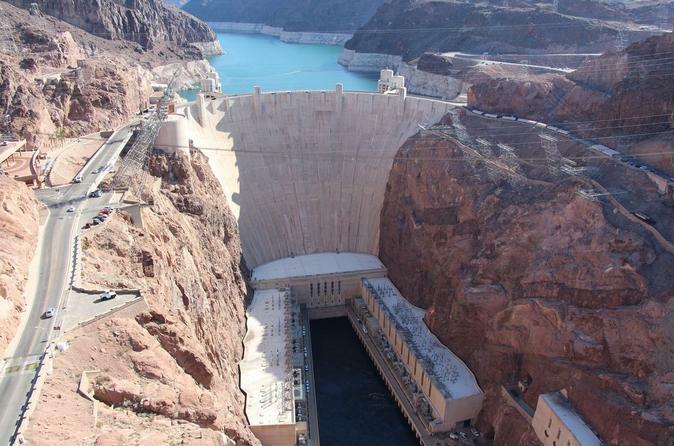 Enjoy a private half-day tour visiting the Hoover Dam followed by a private city tour of Las Vegas. Before and after your Interior Tour of the Dam, you'll have plenty of photo opportunities along the Bypass Bridge and Lake Mead Overlook. You'll then tour Las Vegas with a fun and knowledgeable tour guide making stops downtown and at the famous 'Welcome to Las Vegas' sign! This tour is exclusive to Viator and cannot be booked anywhere else! After pickup from your Las Vegas hotel you'll leave Las Vegas behind as you travel to Boulder City, home to the Hoover Dam. Known as one of the world's greatest feats of engineering, the Hoover Dam, sits 726ft above the mighty Colorado River which flows between Arizona and Nevada. Constructed between 1931 and 1936 during the Great Depression and spanning Black Canyon, Hoover Dam demonstrates a massive effort involving thousands of workers. You'll first stop along the Bypass Bridge for photo opportunities. As you stroll across the Dam from Nevada to Arizona, be sure to look down for a unique view of the Dam's walls. You'll then take the Interior Tour of the Dam (non-private) which will included in depth look of the inner workings of this magnificent structure. Following your 40-minute tour, stop for another photo opportunity at the Lake Mead Overlook to view the largest reservoir in the United States. After your Hoover Dam experience, your guide will take you on a historical journey through Las Vegas. You'll cruise down the famous Las Vegas Strip, stop downtown to see Fremont street (the original Las Vegas) and take photos at the 'Welcome to Las Vegas' sign! Please note: price displayed is valid for five (5) passengers.